Los Angeles, CA—Hotel developers are beginning to look to the location and community for design inspiration. 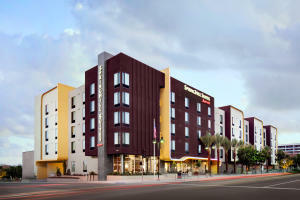 The recently opened Marriott SpringHill Suites in Burbank is the perfect example. Developed by R.D. Olson Development and built R.D. Olson Construction, the hotel design and amenities are informed by Burbank’s rich entertainment history—and in some cases, atypical for the hotel brand. Infusing pieces of the community into the hotel helps attract guests and locals alike. To find out more about this trend and how the team approached the design of this property, we sat down with R.D. Olson Development VP of asset management Jonathon Vopinek, R.D. Olson Construction president Bill Wilhelm and R.D. Olson’s VP of interior design Sue Ellen Langford. GlobeSt.com: What are hotel guests looking for in their common amenities that guests weren’t demanding 5 years ago? Bill Wilhelm: Guests are looking for a variety of things from each property that they encounter. Specifically, flexibility, experience, visibility and communal openness are traits that speak to hotel guests today. All of these qualities tie into the end-users’ desire to have the property serve them in all aspects of their lifestyles. Jonathon Vopinek: Five years ago, streaming a Netflix account through a hotel television wouldn’t have crossed anyone’s mind. Now, it is something that will become an industry standard in the near future. We are proud to offer this type of service in the SpringHill Suites, as we believe it is important to keep up on the latest technology and deliver it to our guests. Lobbies with creative spaces are becoming more and more popular. People want to gather in hotels’ common areas, instead of just coming down to the lobby to get a cup of coffee and then heading back up to their rooms. Additionally, incorporating local art into the interior design of a hotel has become popular. Over the last few years people have made an effort to support local businesses, so to see a hotel doing the same creates a genuine experience for the guests. GlobeSt.com: How did the surrounding market affect the design of the property? GlobeSt.com: What was your inspiration for the design of the hotel? Sue Ellen Langford: The interior design conveys a media centric concept that has a custom boutique feeling that taps into the nostalgic glamorous lifestyle of the TV and Movie insiders, while maintaining the reliability of a Marriott select service brand. The simple elegance of the finishes within a fresh contemporary context creates a perceived elevated value that still feels comfortable and approachable.